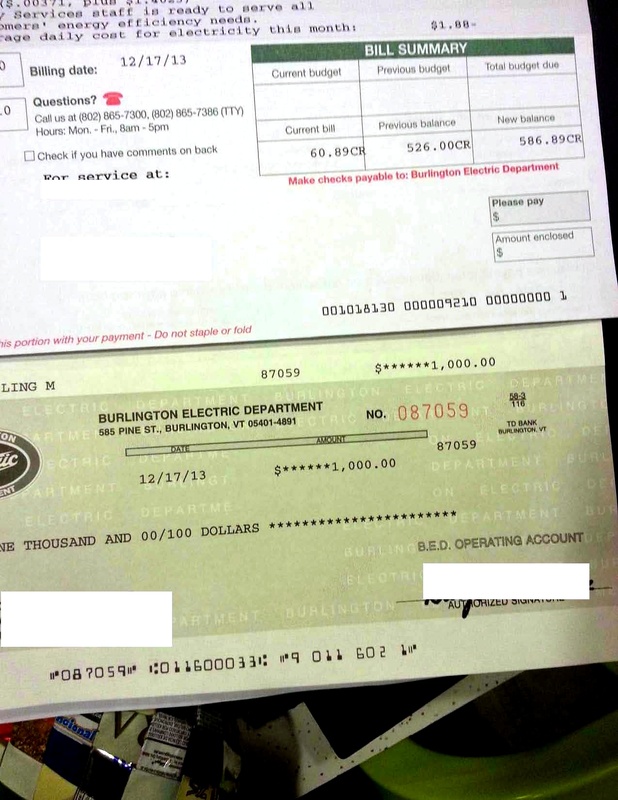 Our utility sent us a $1000 check for the electricity we generated with our solar panels. We still have a $586 credit to carry us through the rest of the cloudy season. It’s been 16 months since we fired up the PV array (solar electric system). We’ve been making more electricity than we use ever since. Thanks to Vermont’s energy-friendly regulations we hold on to that electricity credit for the lean months, and our utility even credits us a “solar adder” which amounts to almost 30% extra. Last year we heated with wood, but this year things are different. Our primary heat is now a heat pump, and we now charge our electric car at the house. We’ve been dipping into that solar electricity surplus in a big way. As I talked about in the Seasonal Energy post, Vermont only requires utilities to hold onto a renewable energy surplus for 12 months. When it became clear that we weren’t going to use up last year’s 10,000+ kWh of solar electricity I called our utility to find out how quickly it would be disappearing off our balance. Much to my delight, I was told our utility doesn’t expire the credits, and furthermore, contrary to everything I’ve understood about renewable energy in Vermont, they’d be happy to send us a check for the credit anytime we want. Whoopie! Now that we’ve had our heat pump and electric car for a few months I’m beginning to get a sense of how much electricity we’ll use in the winter. That left me feeling confident that a big chunk of the surplus in our electric account is actually surplus that we’ll never use. So, unless the sun really does fail to make a comeback in February, I can cash it out. Still leaving us a substantial cushion to carry us through these last few, dark weeks, we got a thousand dollar check from our utility this week. How’s that for payback? That’s a nice Christmas present! I’m proud of you guys!